The study, published today in Proceedings of the National Academy of Sciences, was led by Karina E. Guziewicz, a research assistant professor in Penn's School of Veterinary Medicine, and Artur V. Cideciyan, a research professor of ophthalmology in Penn's Perelman School of Medicine. The research is part of a long-standing partnership between Penn Vet and Penn Medicine scientists to push forward gene and other novel therapies for blinding disorders. "In the eye, you have these two integral retinal cell layers that puzzle into one another and, like a zipper, they interweave your vision cells and the support cells," Cideciyan says. "What this disease is doing is basically unzipping those layers, and what we've done is rezip them, bringing them together tightly." "With this research," Guziewicz says, "we have demonstrated that there is a therapy that is working in a large animal model. Following safety studies, a human clinical trial could be less than two years away." Guziewicz and Cideciyan's colleagues who collaborated on the work included vision scientists from Penn Vet's Division of Experimental Retinal Therapies, Gustavo D. Aguirre, professor of medical genetics and ophthalmology, and William Beltran, professor of ophthalmology; and from Penn Medicine Samuel G. Jacobson, professor of ophthalmology. Through a variety of studies during the last several years, the Penn team has shown that dogs, too, develop a strikingly similar disease. A 2014 study led by Beltran revealed that dogs, like humans, have a tiny region at the center of their retina that is densely packed with cone photoreceptor cells–those responsible for reading, driving, and perceiving fine details–called a fovea. BEST1 mutations in both humans and dogs compromise the fovea, leading to vision loss. "This was unexpected," says Aguirre, "and helps explain this puzzling finding in the disease that, while patients have lesions that are very local, when you do electrophysiological measurements you see that there is a retina-wide defect. Now that we can see this separation happening very early between the RPE and photoreceptors, we know that the disease involves a structural abnormality across the retina that precedes the loss of photoreceptor cells." It's unknown whether this association with light is present in human patients. But the researchers did take steps to show that a similar separation between RPE and photoreceptors is affecting vision. By measuring the time it took for patients to adjust to darkness, or acquire "night vision," the researchers obtained a proxy for the time it takes for nutrients to diffuse between these two layers of cells, a process that enables dark adaptation. They showed that a longer distance was associated with much slower rates of nutrient transport. "This flow of nutrients normally occurs over a very small distance," Cideciyan says. "So if you have a separation between these two layers, the recovery rate to get night vision slows down. The implication is that, if we could correct the apposition of these two tissues, we would correct the visual defect as well." Remarkably, they were able to correct both mild and more severe lesions. Close examination of the eyes of treated dogs revealed that the gene therapy restored the "zipper" structure between RPE and photoreceptor cells. To ensure their therapy was functioning to correct this RPE-photoreceptor interface, they exposed to light the eyes of dogs that had been previously injected with gene therapy and saw that the triggered RPE-photoreceptor cell separation did not occur in the area of the retinas that had been treated. "Since we understand the mechanism of disease better than before," says Guziewicz, "it also allows us to understand the mechanism of rescue. We can visualize these projections extending from the RPE that never existed before; it's incredible. That restored the proper apposition between those two cell layers." The therapy appears to be lasting, as the treated dogs' eyes remained disease-free for as long as five years. "On a human level, there are a lot of families who know that previous generations have had this disease, and the young people can live in fear of whether it is going to affect them," Jacobson says. 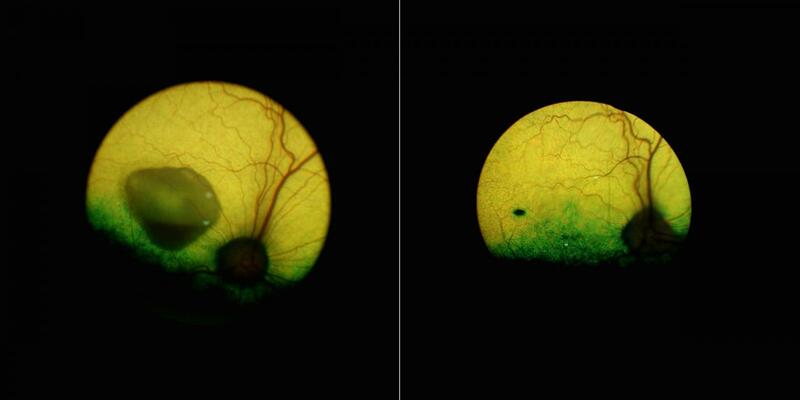 "This is the unveiling of a mechanism and a treatment for a previously untreatable form of juvenile or inherited macular degeneration, and that's a major step forward." In addition to Guziewicz, Cideciyan, Aguirre, Beltran, and Jacobson, the paper was coauthored by Penn Vet's András M. Komáromy, Valérie L. Dufour, Simone Iwabe, Gordon Ruthel, and Brian T. Kendrick; Penn Medicine's Malgorzata Swider and Alexander Sumaroka; the University of Florida's Vince A. Chiodo and William W. Hauswirth; and the University of Toronto's Elise Héon. The study was supported by the Foundation Fighting Blindness (FFB-TRAP and FFB-Facility Grants), Macula Vision Research Foundation, the National Institutes of Health (grants EY06855, EY17549, EY001583, EY019304, EY025752, and RR027128), the Van Sloun Fund for Canine Genetic Research, and Hope for Vision.